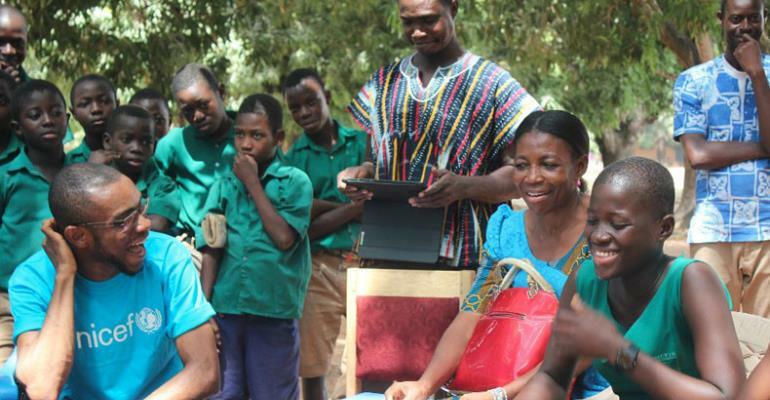 Four of Ghana's best known personalities joined UNICEF in the call for fairer chances for adolescent girls in Ghana, as they travelled to schools and communities in the Northern Region. Musicians M.anifest, MzVee and Wiyaala, and sports broadcaster Gary al-Smith were part of a UNICEF delegation that met adolescent girls and boys where they listened to their challenges, encouraged them in their ambitions – and promoted a healthier lifestyle through encouraging girls to engage in physical activity by playing more Ampe – a popular playground game in Ghana – or participating in sports. There are approximately 5.5 million adolescents – children aged between 10 and 19 years old – in Ghana, and this population is likely to increase in the next few years. Several challenges beset adolescent girls, in particular. Research has found that one in five girls is married before her 18th birthday in Ghana – and one in three girls in the three northern regions. Nearly one in two of all adolescent girls aged between 15 and 19 years are anaemic – resulting in less energy and attention to engage in schooling, physical exercise or other activities. Just over one in three girls aged 15-19 years reported to have experienced at least one act of sexual violence. Almost all adolescent girls sometimes miss school due to menstruation and half of all females aged between 15 and 24 years old do not engage in any form of physical exercise. With the support of the Korean International Co-operation Agency (KOICA), UNICEF is working to address many of these challenges facing adolescent girls in Ghana, including reducing the levels of gender based violence and child marriage and providing opportunities for girls to overcome barriers as they define and shape their ambitions. Work also includes enabling more adolescent girls to stay in school at junior and senior high level, through a variety of ways, including support for rural girls and teenage mothers, the provision of iron folic supplements to tackle anemia through its GIFTS (Girls Iron Folic Acid Tablets Supplements) programme, providing adequate sanitation facilities at schools and educating girls and boys about dignified menstrual hygiene management.